Movement and nomadic value are given new meaning through the versatility of denim and the visual reference of the 'bag'. The wearer becomes a cultural and migratory nomad, where the bag becomes a hybrid entity to protect those within it. The tactility and gesture of the ‘bag’ has resulted in garments that are grounded by precise seams, ambiguous asymmetrical drape and body-less proportions. The materiality further encompasses the tactile and functional features of the 'bag' through the balanced combinations of stone and acid washed denim, laminated and creased surfaces along with raw, sandpapered and frayed finishes. 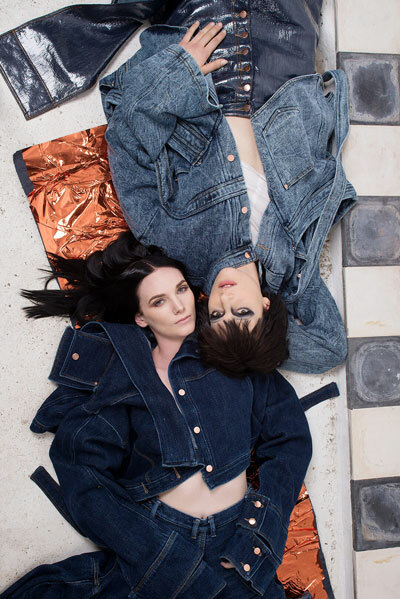 Denim is transformed into high end wearables that enlighten overlooked materials and provoke a disruption to class, status and gender roles.